Farts R Fun says, "Happy Halloween!" Pillsbury Doughboy Costume: We have been receiving a ton of searches for Pilsbury dough boy costume so we thought we'd help those folks searching for the costume find it a little easier. And, of course being that we're a fart site we had a great accessory idea to add to your Pilsbury Doughboy Costume that would make it an absolute riot. 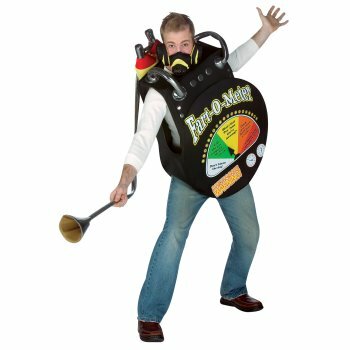 Purchase the Remote Control Fart Machine along with your Doughboy Halloween costume and whenever someone pokes your tummy to get you to giggle (and you know they will!) let your remote controlled fart machine rip off with a big juicy fart. Now that's classic!! This Pillsbury Doughboy Costume for Haloween brought to you by HalfPrice Costumes. 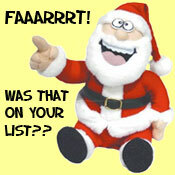 See our Holiday Farts category for more great Fart Costume ideas. Here it is!!! The new and improved Fart Machine. As seen and used on the Howard Stern Show, this remote controlled Fart Machine works up to 100 feet away & through walls. 15 realistic fart sounds. This new fart machine features new boom box technology for some booming farts. Put the Fart machine in one place and hide, Press the button for a million laughs. Great for use in schools, movie theaters, lunch room, Grandma's house or where ever people are. This fart machine is the funniest gag item since the whoopie cushion. Uses 4 AAA batteries. Fart gifts for Halloween. Ok... just one more fart related Halloween item to share with you. Who wouldn't just have a great time with this little fella? He's sure to be the hit of any party with all of his zany farting humor! This farting dracula has plenty of great funny fart sounds and fart antics. In the 1999 comedy film Mystery Men, flatulence is the superpower of the character "The Spleen". He triggers this power by asking another person to "pull my finger". In 2006, Dairy Queen advertised a burger whose slogan was "it will make a man out of you." The commercial featured a woman who, after eating just one bite of the burger, promptly shifts to a sitting position like the man seated beside her, then dares him, "Pull my finger." The 2006 movie 'Children of Men' has the character Jasper repeat this joke several times, even while being shot to death! The father of JD, the main character in the medical comedy series 'Scrubs', uses the line, after which he says, "I think I pooped a little." If missed yesterday's highlighted fart costume "The Whoopee Cushion" you can see it here.